Looking for a career at RYCO Hydraulics? RYCO Hydraulics is known for its dynamic, world leading fluid conveying technology. Whatever you’re interested in – engineering, product development, sales, finance, marketing, IT or working in the field – we’ve got plenty of opportunities to turn your dream job into a reality. All RYCO employees regardless of their department and job role help us to achieve our goals. With over 13 branch offices/assemblies, 7 sales/marketing headquarters, 3 manufacturing plants in 9 countries, RYCO employees enable us to deliver technologically superior fluid conveying connection products and solutions. It takes a dynamic and dedicated team to bring together a wealth of industry knowledge and market experience so that we can ensure quality products are delivered to our clients whenever and wherever required. Find out what it's like to work at RYCO and why our team wouldn't work anywhere else! Determine and establish procedures and quality standards. Monitor these against agreed targets within the company. Provide technical safety support to production personnel. Develop a safety plan and coordinate training for all personnel. Establish a quality system and promote customer satisfaction. Monitor safety regulations and provide technical support to RHAM personnel. Initiates and implements quality improvement activities as appropriate (e.g. Kaizen, Six Sigma) to raise the performance of the company’s product lines. Educate and train employees as to the impact in the quality management system. Develop, implement, manage and integrate a quality system. Assess customer requirements and ensure that these are met. Design, implement and document procedures for process control, process improvement, testing and inspection. Analyze customer’s product specifications to establish efficient, cost-effective requirements for ease of manufacture and productivity. BS/BA in Mechanical Engineering, Electrical Engineering, Manufacturing Engineering or Business Administration. 10+ years’ experience in QA systems implementation and management with 5 years as a CQE/CQM in a medium-size manufacturing environment, preferable in the hydraulic hose industry. Proven track record of business performance improvement. Experience in designing and implementing quality systems. Diverse knowledge of inspection and control methods, techniques and documentation. Strong computer skills including work processing and Excel. Thorough understanding of general safety requirements. Direct supervision of employees in a manufacturing setting. Ability to effectively deal with other people, especially other company personnel, to enlist needed cooperation in implement safety and regulatory requirements. Ability to deal with regulatory agencies, consultants and other personnel as required. The employee must occasionally lift and/or move up to 25 pounds. Specific vision abilities required by this job include Close vision, Color vision, Distance vision and Ability to adjust focus. While performing the duties of this Job, the employee is regularly required to sit; use hands to finger, handle, or feel and talk or hear. The employee is frequently required to walk and reach with hands and arms. The employee is occasionally required to stand, stoop, kneel, crouch, or crawl. The employee has read, understood and accepted this Position Description. The employee is not aware of any condition (physical or psychological) which may negatively impact on his/her ability to carry out the duties as described. The primary objective of the Supply Chain Manager is to direct the materials, planning and logistic functions of RYCO Americas to ensure customer needs are satisfied. The Supply Chain Manager is responsible for planning and maintaining a material procurement process which establishes and achieves the least total cost, best quality and timely delivery for material purchases from local and overseas suppliers. In addition they must supervise purchase of production and/or non-production materials according to schedules or purchase requisitions and coordinate suppliers to meet Company’s goals in regards to quality, delivery and cost. Establish and maintain positive employee relationships to ensure that employees are engaged in and committed to providing a quality service to key suppliers. Coordinate all planning and scheduling activities to achieve customer delivery requirements;. Continuously work to minimize items on Back Orders from local and overseas suppliers;. Any other related tasks as directed. Bachelor’s Degree (BS) in Business or a related discipline and 5-10 years of supply chain experience; or more than 10 years of experience in lieu of a degree. Understanding freight forwarding processes and experience with dealing with freight forwards, customs agents and suppliers. Demonstrate proficiency in Microsoft Office, particularly Excel and PowerPoint, is required and experience with ERP systems such as M3, SAP or ORACLE is essential. Work environment varies depending on job function: Well-lighted, heated and/or air-conditioned indoor office/production setting with adequate ventilation. 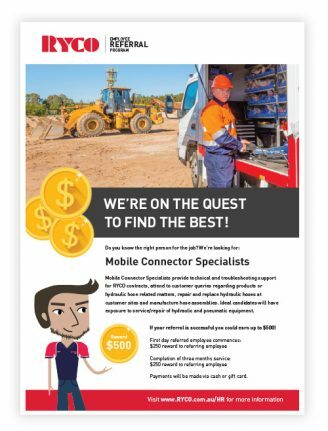 Mobile Connector Specialists provide technical and troubleshooting support for RYCO contracts, attend to customer queries regarding products or hydraulic hose related matters, repair and replace hydraulic hoses at customer sites and manufacture hose assemblies. Ideal candidates will have exposure to service/repair of hydraulic and pneumatic equipment. We are on a quest to find the best! If your referral is successful you could earn up to $500! Payments will be made via cash or gift card. 1. Submit the candidate’s CV and Cover Letter to HR@RYCO.com.au and tell us why you think the candidate would be suitable (in a few sentences). 2. Claim your reward if the referred candidate is successfully placed in an eligible role and at 3 months service. Please note that there is no limit on the number of candidate referrals an employee can submit, however the employee must receive permission from the candidate before submitting their application. Upon receiving a referral, HR will review the application on its merits. The referral of a candidate does not oblige RYCO to conduct an interview and the decision to employ the candidate is at the discretion of RYCO. Progress of the referred candidate’s application is a confidential matter between RYCO and the candidate and does not need to be shared with the referring employee. The referring employee will however be notified if their referred candidate is successful in obtaining a role, and when 3 months service has been completed. Referrals that do not follow the correct process or comply with the rules of the program, including where the employee referral is submitted retrospectively i.e. received after the date of the first interview, or where the introduction is verbal or ad-hoc, will not receive a referral reward. The referral reward is a gross amount and will be subject to taxation, and processed in the subsequent pay period. In order to qualify for the reward, both the referring employee and referred employee must be employed by RYCO at the time of payment. Neither the referring employee or the referred candidate may be in their notice period to terminate. This reward cannot be split by multiple employees. When more than one employee has referred the same candidate, only the first person to submit the candidate will receive the reward.